Is this a harmonica record? Yes, and no. If you’re looking for a record where harmonica is the front-and-center solo instrument, you may not notice (at least not right away) all the cool, yet not-always-obvious stuff the harmonica is doing on this album. However, if you’re willing to listen for imaginative, subtle ways to integrate the harmonica into a musical fabric, it will reward your listening time – and the music itself may delight you. In the 12 tracks on this album, the second for this duo, there are dozens of harmonica parts, played on diatonic, single-reed and double-reed bass, chord, chromatic, and polyphonia (a specialty harmonica designed to play a chromatic scale in a single breath across neighboring holes). Yet harmonica dominates on only a few tracks and is completely absent from one or two. For most of the album, harmonica is just one element in a kaleidoscopic, ever-changing profusion of styles and instrumental combinations. It pays to listen on headphones to pick up on all the layered harmonica parts hidden in the picture. So who are the Sheriffs of Schroedingham? Their nucleus is the duo of guitarist John Schroeder and pianist/harmonicist Ross Garren. They are augmented on this record by their own overdubs and also by guest musicians from their circle of talented young friends on the Los Angeles music scene. I’ve known Ross since he came to me for a few harmonica lessons when he was 15 (nearly half his life ago!). Later he studied blues harmonica extensively with David Barrett before attending music school at USC and emerging as a film composer and pianist. In recent years he’s rekindled his love for the harmonica and brought his imagination and considerable technique to bear on a whole new repertoire. And what a repertoire it is! I’m tempted to think of this album as a calling card for his versatility as a soundtrack composer. Every time I listen, I hear different styles and influences, and often a track will effortlessly move from one style to something completely different in a way that delights the ear. So what’s going on in the different tracks? The opener, Whitefish, is all clean acoustic guitar that seems to echo the boy-scouts-hiking-in-a-national-park cover art. The second, title track, Going to the Sun, starts with a cascading, funky acoustic blues guitar lick that is quickly joined by an electric band and third-position amplified blues harp. As with most of the tracks on this record, it’s hard to sum up stylistically. Country funk is about as close as I can come. Ross’ harmonica and John’s slide guitar trade solos. In addition to Ross’ out-front solo harmonica, note the subtle background harmonica parts – the itchy-rhythm backing part played in wide splits and the reverb-drenched drone harmonica behind the melody. Three layered harmonica parts just in the second track! Named for Burt Bacharach, one of the most famous and prolific hit songwriters and film composers of the 1960s and early ’70s, the tune captures the joyful yet sardonic tone so characteristic of that period. You may be surprised to see Ross using baritone polyphonia harmonica like a French horn along with the kazoo section, vocalist, and synth strings. Listen for chromatic played in octaves (doubled by polyphonia) along with occasional chromatic-scale glisses on the polyphonia at phrase ends, and little twittering trills on the chromatic. Many of these touches are not noticeable, even when listening with headphones, until you see them on the video. Once again, we experience multiple harmonica uses and roles in a single track that sounds as if it were played by a studio orchestra, yet it’s all created by three musicians (including guest vocalist Chelsea Williams laying down four-part harmonies and using a kazoo to fake a brass section; not sure she’d want that latter on her list of credits – the things you have to do to make a buck in this town!). Crisco Sid starts out like an old-time acoustic guitar-harp duet but quickly acquires bass and chopping rhythm guitar behind the slide. Congas and other guitars quickly add layers – and where did the harmonica go? Steel drums (or a synth patch) – huh? How did we get so far away from back porch blues? We’re sort in Donald Fagen Nightfly territory. Or in a sort of rock/funk guitar jam, with occasional reminders that the harmonica’s still around with some bent chords welling up now and then. The brief Flathead brings back the pure, simple acoustic sound of solo guitar, in a contemplative mood out in the woods somewhere, sounding pretty chords that are not usually associated with slide guitar. Stonefly continues with acoustic guitar, but you know something else is coming. Pure-toned acoustic harmonica with reverb drops long, ringing notes over the guitar arpeggios, with electric guitar, bass, and subtle percussion filling in the sound. And soon things perk up with buzzy bass-string guitar (reminiscent of the Twin Peaks theme) taking the melody in a more muscular direction, underscored by insinuating bass harmonica, before the first theme returns more mysteriously than before. Big Mountain Boogie takes us into the lap of blues harmonica master Big Walter Horton – sort of. That bass harmonica under the Walter-inspired melody is the first clue that things aren’t going to follow the usual template. And Ross plays against expectation, playing true to Walter’s style and then deliberately dropping in ideas from bebop without making them sound out of place. He even sneaks in a few discreet overblows. Late in the tune, see if you can pick out a ghost harmonica part behind the main melody. Columbia Falls introduces stringed harp, violin, and banjo, along with piano and slide guitar that echoes the melody of the opening track, Whitefish. These periodic little springs of clear water seem to form a unifying refrain and palate cleanser in the midst of the musical smorgasbord. Boogie Woogie Spaceship Stowaway starts out with little binking percussion noises that slowly coalesce into a mid-tempo boogie with some subtle chromatic harmonica chording that suddenly turns into something slide guitar-dominated that sounds like an outtake from Abbey Road, which in turn yields to some two-fisted boogie piano from guest artist Sasha Smith. Another twist and that piano sounds like it’s sending satellite signals before finally winking out. The Hidden Lake is a brief 29-second interlude that works off echoing various guitar and keyboard effects before yielding to the final cut, Stumptown Black and White, that delivers a 1930s-style sweet, romantic melody, first on baritone polyphonia and then chromatic harmonica, with chordal backing from both acoustic guitar and chord harmonica, with bass harmonica eventually joining in. Ross Garren: All other reeded and keyed instruments. 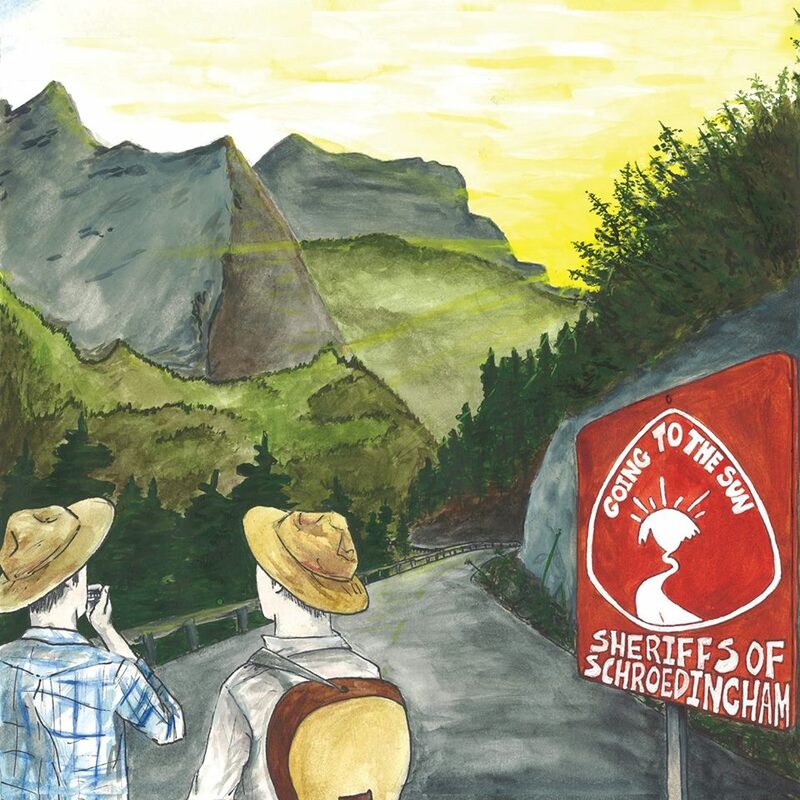 You can find the Sheriffs and in a variety of projects on their YouTube channel, and visit their website and Facebook page where you can see more video and sample and purchase both Going to the Sun and their previous album, High Noon. You can also find Ross and his other projects at his own website, with links to his film scoring work as part of another duo, Garren & Cohan, and his Taggart project and album, which includes harmonica but is more focused on atmospheric electronica.